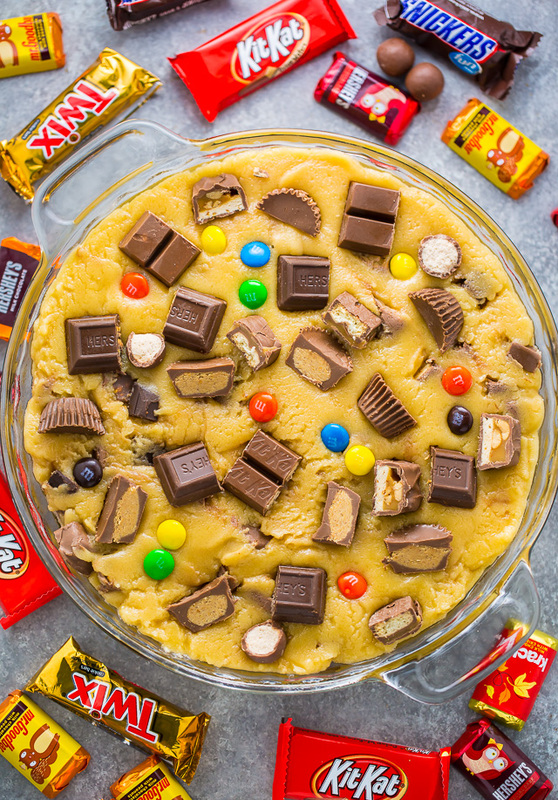 This easy to make Halloween Candy Cookie Cake is the perfect way to use up leftover candy! A hit with kids and adults! Halloween is in just a couple of weeks! Can you believe it? Crazy how this season is flying. 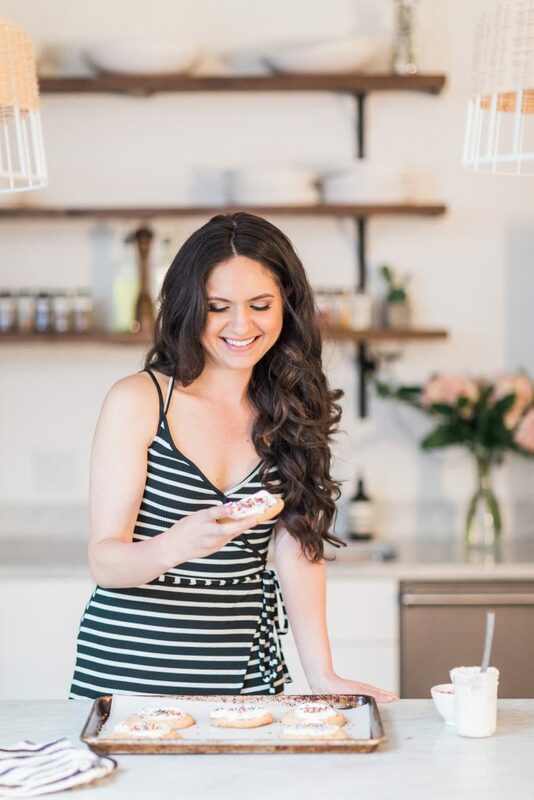 Since you’ll be knee-deep in an assortment of miniature candy bars before you know it, I thought a recipe to help you use some of them up was in order. This Halloween candy cookie cake did the job pretty good! 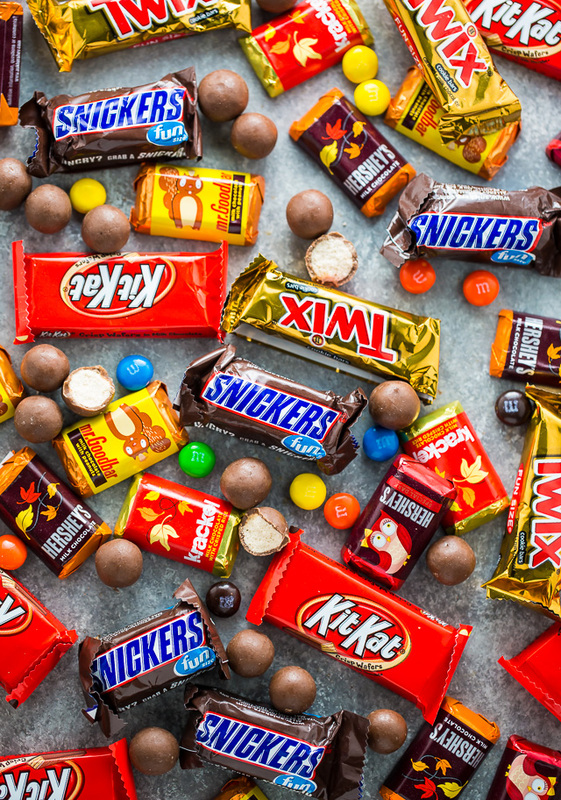 I actually had to run to the store to get more fun-sized candy treats just in case we get some adorable trick-or-treaters on the 31st 😉 Handing out candy to the cute lil’ kiddos in goofy costumes is my favorite part about Halloween. 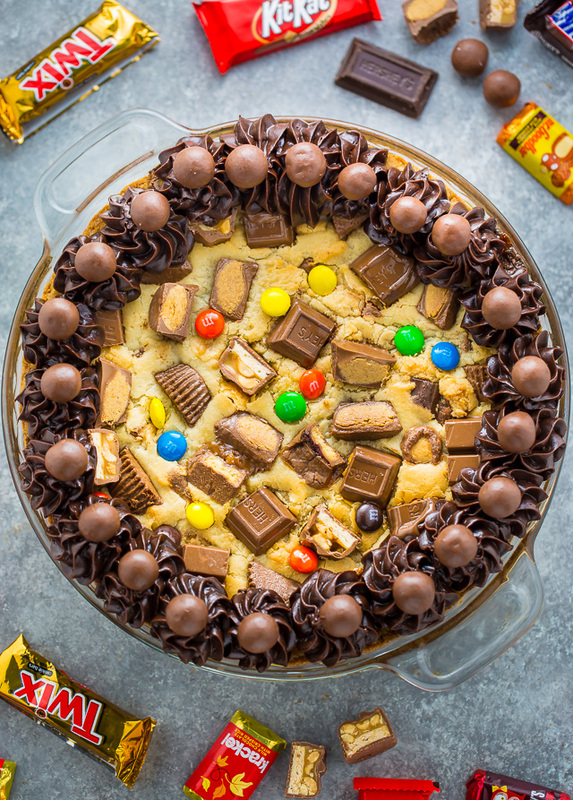 This cookie cake was a HUGE hit at a recent housewarming party we had, and I even caught my friend Lizzy – who apparently “doesn’t like candy” – swiping a second slice! Ha. Doesn’t like candy… said no one EVER! 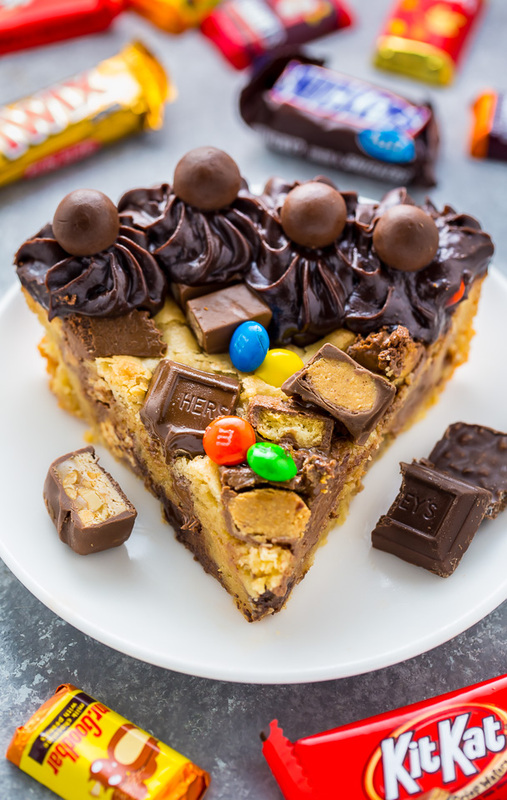 This easy to make Halloween Candy Cookie Cake is the perfect way to use up leftover candy! A hit with kids and adults. Preheat oven to 350 degrees (F). 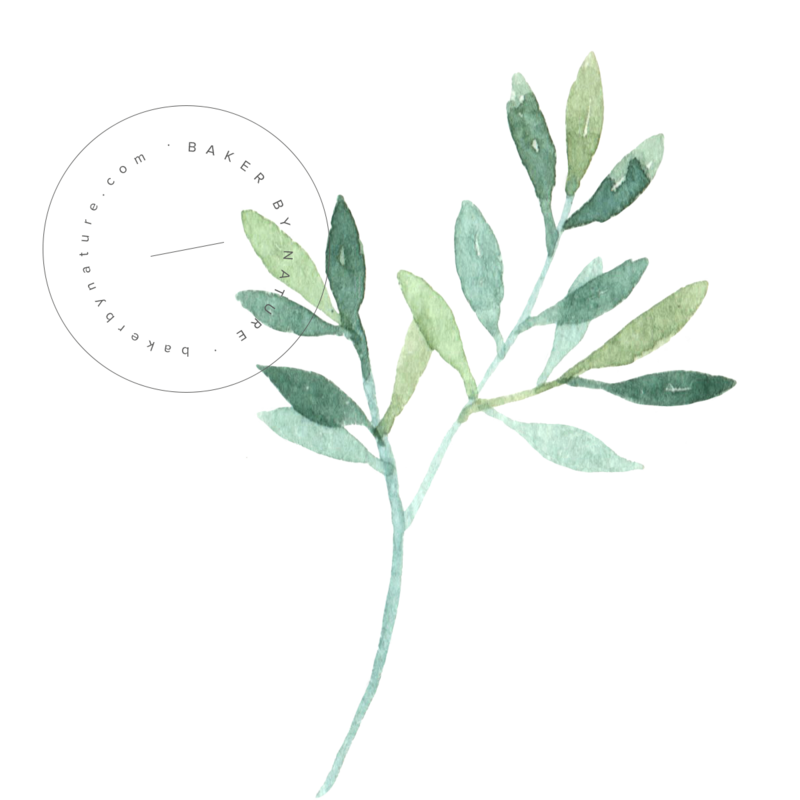 Lightly spray a 9" pie plate with non-stick baking spray; set aside. In a large bowl add the melted butter, brown sugar, and granulated sugar; beat well until combined. Cool for 5 minutes, then beat in the egg, egg yolks, and vanilla. Add in the flour, cornstarch, and salt and mix until just combined. Be sure not to over mix here! Fold in the chopped candy bars. Spread the mixture into the prepared pie plate (it will be very thick), smooth the top, and bake for 35 minutes, or until the top is golden brown, the edges are completely set, and the center of the pie is only slightly jiggly. 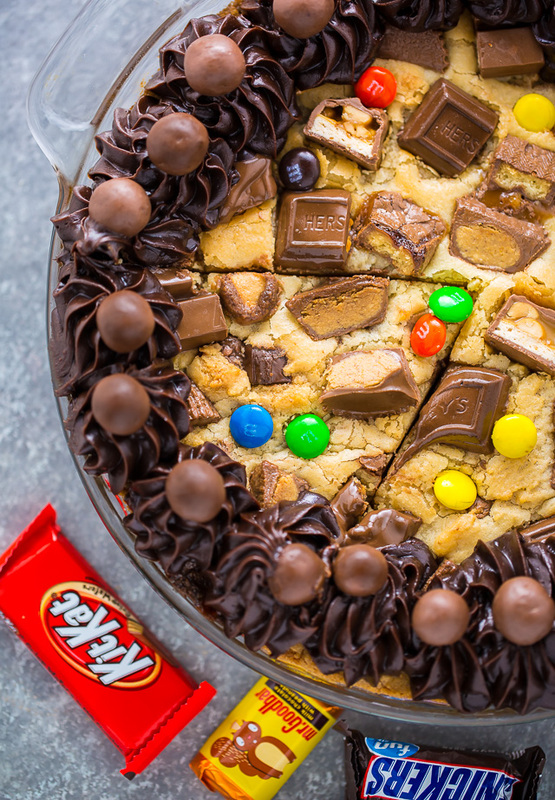 Top the warm cookie cake with extra candy, if desired. Transfer cookie cake to a wire rack to cool for at least one hour before topping with frosting (if using) and slicing. Sift together the confectioners sugar and cocoa powder, whisking well to ensure it's bump free. Using a handheld mixer OR a stand mixer fitted with the paddle attachment, beat the butter on medium-high speed until creamy; about 2 minutes. Reduce speed to low and slowly add the sifted sugar/cocoa powder, alternating with the cream, then add the vanilla and salt. Once all of the ingredients have been added, beat on high speed until light and creamy, about 2 minutes. Scrape frosting into a piping bag fitted with an open star tip and pipe onto the cooled cake. 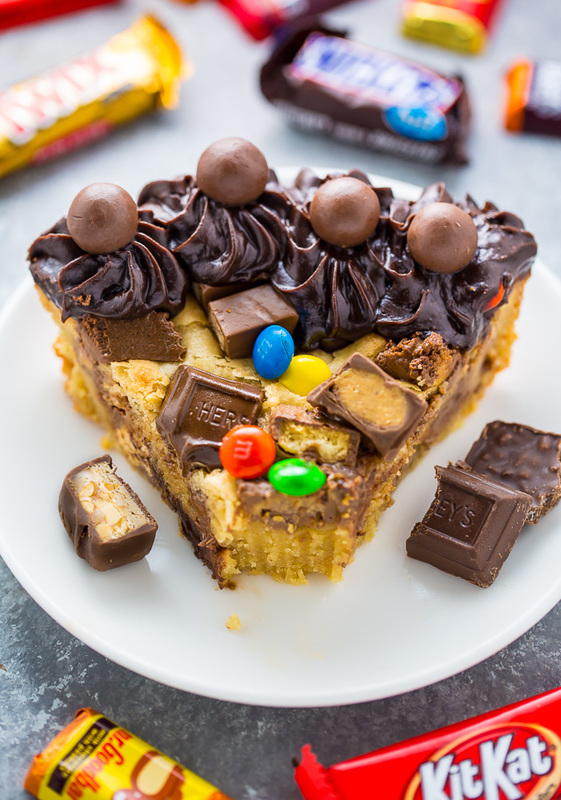 You can use any variety of chocolate candy you have on hand for this cake. Cake is best eaten the day it's made, but will keep, covered, for 3 days. This looks like such a fun idea! We don’t have trick-or-treat’ers in my building but I bought candy anyways! 😉 And now I am so glad I did! Pinned! This is every kid’s (and adults) DREAM!!! Oh my goodness, I can’t with this. Looks AMAZING! And since I don’t have any kiddos’ candy baskets to raid just yet, guess I’ll have to meander down the candy aisle myself . . .
DAYUM! This looks good, bring on the candy!! What a fabulous way to enjoy the candy of the season! 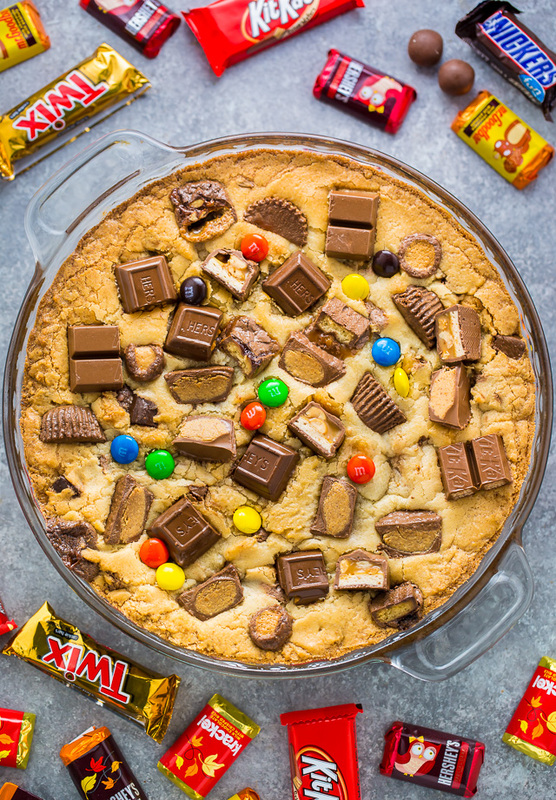 Candy and cookies in one dessert–sign me up! This pie looks sinful. WHAT A SUPER WAY TO USE IT ALL UP IN SUCH A SCRUMPTIOUS WAY – DOING THIS WITH MY GRANDDAUGHTER THE DAY AFTER – YUM…IT WON’T LAST LONG! Thanks so much, Ann! I bet your granddaughter is going to love making this cake with you!